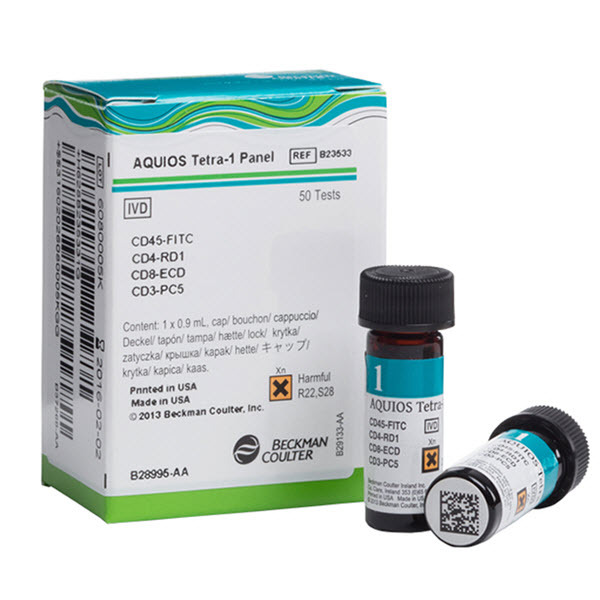 AQUIOS reagents are optimized for peak performance when used with the AQUIOS CL Flow Cytometer. High reliability with no need to mix your monoclonal antibodies. In the clinical management of immune deficiency diseases, accurately counting the absolute cell numbers of leukocyte subsets and measuring the percentage of individual subtypes in blood is critical. The AQUIOS CL Flow Cytometer System in combination with AQUIOS Tetra reagents provides a Single Platform Technology (SPT) for lymphocyte subset analysis and enumeration without the need for counting beads. By focusing on the most essential parameters for monitoring HIV therapies (CD45 vs CD4), AQUIOS PLG addresses cost, complexity, and the time previously required by labor-intensive processes to provide busy laboratories with an affordable, high-performance monitoring solution that also offers standardization and simplicity. Its efficient operation takes CD4 testing to new places. AQUIOS PLG (PanLeukoGating) Panel is available in Angola, Botswana, Ethiopia, Ghana, India, Ivory Coast, Kenya, Lesotho, Liberia, Madagascar, Malawi, Mauritius, Mozambique, Namibia, Rwanda, South Africa, Swaziland, Tanzania, Uganda, Zambia and Zimbabwe. AQUIOS PLG Panel is not available in any other markets, including the United States and Europe.